Not only because river dolphins in this region live and breed in the trans-border area of Nepal, India and Bangladesh, but also because upstream development activities can pose serious impacts on downstream habitat, it is essential that conservations efforts include from all sides of these nations. Currently, the RDT works with the Bardiya National Park (Nepal) and Katarniyaghat Wildlife Sanctuary (India) along the Karnali-Geruwa-Katarniyaghat trans-boundary water ways in Nepal and India. 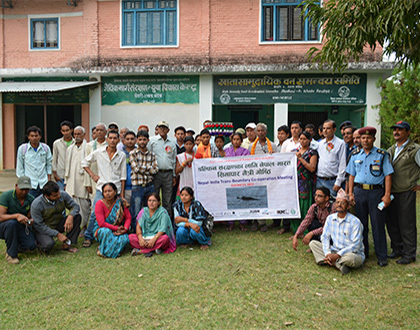 In October 2013, the RDT team convened a trans-boundary cooperation meeting between Nepal and India, at Khata Wildlife Corridor, Nepal to facilitate the Nepal-India cooperation for freshwater biodiversity, including river dolphins. This meeting has been crucial to us for collaborating with conservation agencies of both nations for promoting the research and conservation practices. Although the ground level collaboration has been established and working nicely, national level understanding and agreements among nations is necessary to foster regional conservation planning, capitalize the ground level efforts and make conservation outcomes long lasting. The RDT aims to facilitate the regional collaboration between Nepal, India and Bangladesh for river dolphin and its habitat conservation.